A new study published in the Journal of Urban Health could have a significant impact on the way heroin overdose cases are counted and may dramatically increase the number of reported heroin-related deaths across the country. Researchers Brad Ray, Kenna Quinet and Tim Dickinson from SPEA and Dennis Watson from the School of Public Health, analyzed accidental opioid overdoses in Marion County, Indiana, from 2010 through 2015 and discovered that deaths where heroin was present may be significantly undercounted. Greg Steele, Tim McFarlane and Tom Duszynski participated in a panel discussion and review at Park Tudor Middle School on Tuesday, February 28. The group helped to review epidemic public service announcements developed by the 6th grade class. Students researched an epidemic (TB, AIDS, Cholera, Smallpox) and compared societal response to how European society responded to the bubonic plague in the 14th century. They were tasked with creating a PSA for modern government officials that included tips and advice about things societies should keep in mind when epidemics strike, using examples from the historical case studies. There were 12 PSAs from a group of 59 students. The students wrote scripts and filmed the PSAs themselves. The students were engaged and well informed about the diseases, modes of transmission and control measures. 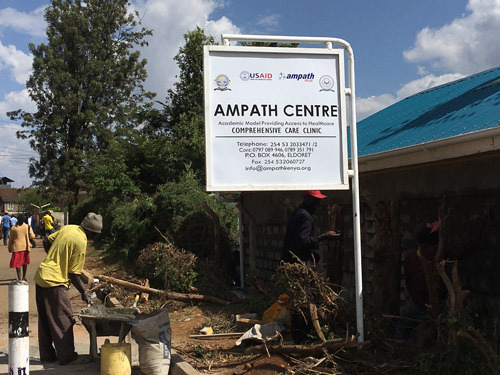 Dr. Babich visited Eldoret, Kenya this week. 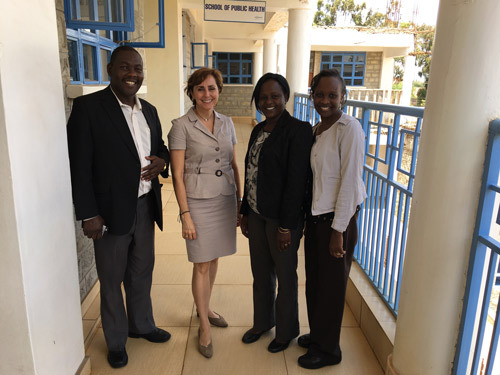 She met with the faculty and staff at Moi University Schools of Public Health and Medicine and AMPATH to discuss opportunities for collaboration with FSPH. 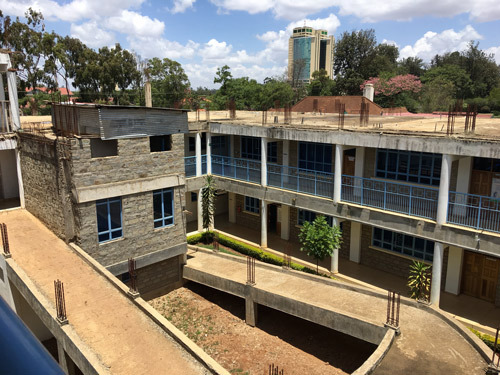 Photos below include a view of the AMPATH center, construction on the Moi School of Public Health building and Dr. Babich with the Moi School of Public Health department heads. Madhuchhanda Bhattacharjee, Associate Professor at the University of Hyderabad and Visiting Faculty in the Department of Mathematical Sciences at IUPUI, will present, "Modelling and analysis of time in-homogeneous recurrent event processes in a heterogeneous population: A case study of HRTs," on Friday, March 10, 1:00pm, in HITS 2070. This work presents a method for the statistical analysis of continually monitored data arising in a recurrent diseases problem. The model enables individual level inference in the presence of time transience and population heterogeneity. This is achieved by applying Bayesian hierarchical modelling, where marked point processes are used as descriptions of the individual data, with latent variables providing a means of modelling long range dependence and transience over time. In addition to providing a sound probabilistic formulation of a rather complex data set, the proposed method is also successful in prediction of future outcomes. Computational difficulties arising from the analytic intractability of this Bayesian model were solved by implementing the method into the BUGS software and using standard computational facilities. This approach is illustrated by an analysis of a data set on hormone replacement therapies (HRTs). The data contain, in the form of diaries on bleeding patterns maintained by individual patients, detailed information on how they responded to different HRTs. The proposed model is able to capture the essential features of these treatments as well as provide realistic individual level predictions on the future bleeding patterns. 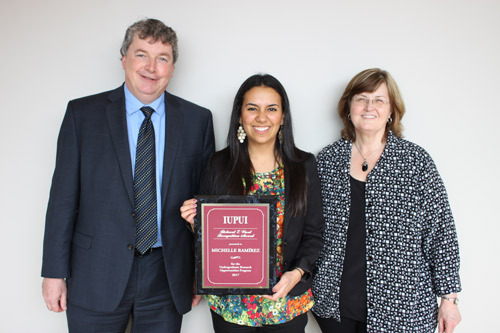 BSPH-Community Health student Michelle Ramirez was the 2017 recipient of the Richard E Ward Undergraduate Research Opportunities Program Recognition Award. Ramirez was honored at the CRL Award Luncheon in the IUPUI University Club on Friday, February 24, 2017.